South Africa 225 and 569 (Hashim Amla 196, AB de Villiers 169, Mitchell Starc 6-154) beat Australia 163 and 322 (Starc 68*, Ed Cowan 53, Dale Steyn 3-72) by 309 runs. 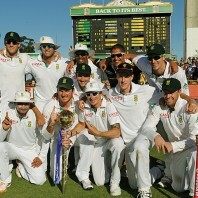 The Proteas were bowled out for 225 runs in their first innings and they amassed 569 in the second. The Kangaroos were dismissed cheaply for 163 runs in the first innings followed by 322 in the second and lost the match by 309 runs. 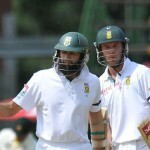 Hashim Amla (South Africa) was declared ‘Player of the match’ for his excellent batting in the second innings where he smashed 196 runs. Michael Clarke (Australia) was declared ‘Player of the series’ for his majestic batting in three Tests. He hammered 576 runs at an awesome average of 144.00, the best of unbeaten 259 with two tons. 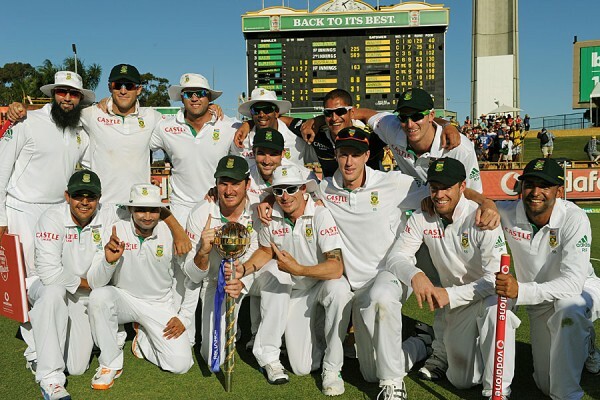 The third and final Test of the series concluded on Monday, December 3, 2012, and that was the fourth day of the game at Western Australia Cricket Association Ground, Perth. Earlier, Australia begun the day at 40 without losing any wicket after 13 overs, David Warner and Ed Cowan were unbeaten at 29 and 9 runs respectively. The visitors got the early breakthrough when Warner was gone on the second ball of the day without adding any run in his overnight score. Shane Watson came in next and tried to bring stability to the innings with Cowan and the batsmen found it difficult to score runs. 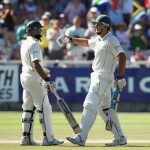 The pair took the score to 81 when Watson lost his wicket for 25 runs. Rickey Ponting appeared in the park to play the last innings of his international career. He was honoured with a guard of honour from the South African team and cheers from the crowd. Cowan hit the first six of the innings on the first ball of the 30th over as Ponting started off with a four three overs later. The poor form of Ponting followed him in his last appearance as well and he was caught by Jacques Kallis off Robin Peterson for just eight runs. Ponting was given an overwhelming accord by all players on the field, spectators and his team mates, officials and commentators as he walked off the crease. The skipper of Australia, Michael Clarke, initiated his innings with a couple of fours in the 38th over and Ed Cowan followed him with the same result in the next over. Cowan achieved his fourth Test fifty on the second ball of the 43rd over with a four but surrendered his wicket three deliveries later for 53 off 149 with 1 six and 5 fours. The fourth wicket fell at 130 when Michael Hussey joined in with Clarke who added two back to back fours in the 49th over. 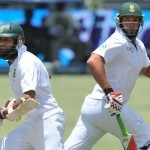 Hussy completed his 6000 Test runs with a four in the 56th over and enhanced the score to 188 with Clarke who was stumped by AB de Villiers off Peterson for 44 runs. Michael Hussey went back to the dressing room after the addition of 10 runs in the total at his personal score of 26 and the home side was struggling at 9-235 in 70.2 overs. The last batting duo of Mitchell Starc and Nathan Lyon provided a tough challenge for the visitors with their determined batting. Starc was the most attacking of the two and hit 2 sixes to Peterson in the following over and continued his aggressive knock with regular boundaries. Mitchell Starc attained his maiden Test fifty on the fourth delivery of the 78th over and the third hundred of the innings appeared on board in the 80th over. The last wicket partnership accumulated 87 runs when Nathan Lyon was caught by Graeme Smith off Dale Steyn for 31 off 43 balls with 6 fours. Mitchell Starc held his end with 68 off just 43 deliveries with 2 sixes and 9 fours as Australia were bowled out for 322 runs in 82.5 overs. Dale Steyn and Robin Peterson were the main wicket takers with three each whereas Vernon Philander and Morne Morkel shared two wickets each. South Africa won the match comprehensively with a huge margin of 309 runs, clichéd the three Test series 1-0 and maintained their top position in the longer version of the game.